Blue was the last film made by the acclaimed film-maker. Written at a time when Jarman knew he was likely to die from AIDS-related causes, the screen is entirely taken up with a deep blue colour with a poetic mostly-auto-biographical text read over it by Jarman. 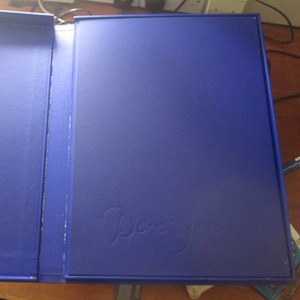 Less known is the artist book Jarman planned before his death – a large-sized book that reproduces the text of his film but contained in hand-painted blue boards, end papers and solander box. Jarman sadly died before he was able to complete the books planned (none were signed for example) but Summerhall will be exhibiting one of only four proof copies made on Jarman’s behalf before his death, the texts from the book and other related material.